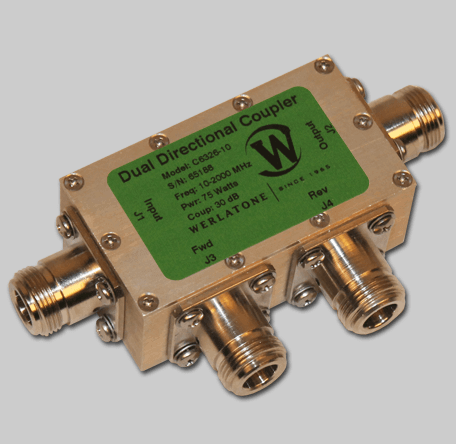 Model C6326 is a very wideband 30 dB Dual Directional Coupler. Covering the full 10-2000 MHz band, and rated at 75 W CW, the C6326 operates with less than 1.25 dB of Insertion Loss and better than 18 dB Directivity. The compact enclosure measures just 2.7 x 1.5 x 1.1" and weighs only 6 ounces. Model C6326 is a very wideband 30 dB Dual Directional Coupler. Covering the full 10-2000 MHz band, and rated at 75 W CW, the C6326 operates with less than 1.25 dB of Insertion Loss and better than 18 dB Directivity. The compact enclosure measures just 2.7 x 1.5 x 1.1″ and weighs only 6 ounces.